As a member of the Specialty Coffee Association of America, our craft roasting facility chooses high-quality beans. Specialty coffees are cupped and stored on a grading system similar to wine. Any coffee that scores less than 80 points is not considered a specialty coffee. In addition to being a specialty coffee roaster, McMenamins Coffee Roasters is also a small-batch roaster dedicated to serving the best coffee as fresh as possible. We receive orders from our pubs on a weekly basis, roast the coffee the next day and ship it to all McMenamins locations. Roasting in small batches allows us to give our full attention to the bean and provide our patrons with the best quality product. 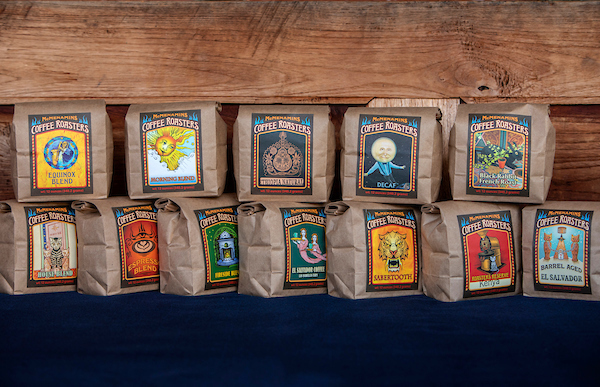 Our houseroasted coffees are served at all McMenamins locations and are available for purchase at our Coffee Roaster or online. Using barrels fresh from our own distillery or winery, we house coffee beans for three months of aging – at which time the beans absorb the barrel flavor, then we roast them, bag them, and send them to our gift shops. 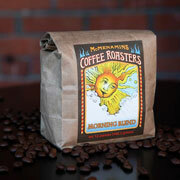 • Hogshead Whiskey Barrel-aged New Guinea: This coffee has a rich body with depth and balance. The time it spent in the whisky barrel imparted the aromas and flavors from our Hogshead Whiskey into the coffee. Its distinct aroma makes it enticing to whisky fans, as well as a great coffee experience that has whisky flavors without the alcohol. • Tradicional Port Barrel-aged Ethiopia Limu Natural: This coffee is a traditional natural processed coffee from the Limu region of Ethiopia. We paired it with the Port Barrel to give it a wine-like aroma and flavor. Ethiopian natural coffees tend to have very pronounced fruit notes, which work well with the flavors from the time resting in the barrel. 12-ounce bag, $11.50 * Available quarterly at our larger retail locations (Edgefield, Kennedy School, Bottle Shop, Anderson School) & select smaller gift shops. This variety has traditionally combined beans from all three major coffee-growing regions (Africa, South America and Asia). Complex, bright flavor with hints of blueberry, dark chocolate and spice. This popular blend is a classic. It is a well-balanced, medium-bodied cup, full of deep chocolate and hazelnut tones. This is the darkest roast that we offer. The coffee is pulled from the roast cycle just before it begins to seep essential oils, letting the beans fully caramelize and impart a smoky, sweet flavor without charring. Farmer Trent blend consists of two mouthwatering selections: The Kenyan used for this blend is a complex coffee with deep stone fruit notes, bright and clean in the finish. The Costa Rican provides the base and mouth feel that fills the mouth with milk chocolate and citrus notes. 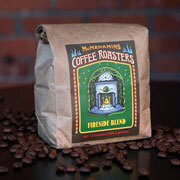 Fireside Blend is our winter seasonal. It is made up from our Sumatra, Kenya, and Colombia. Each of the coffees works together to provide a rich cup perfect for the cold winter days. Full bodied, complex, with nice chocolate notes. 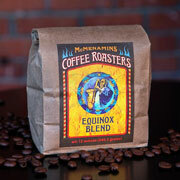 Equinox Blend is our Fall Seasonal coffee blend. Made up of our farm direct El Salvador and Ethiopian Natural coffees this coffee is vibrant and complex. Nice floral notes make it a great coffee for the changing season. We only buy water-processed decaffeinated coffee because of its superior flavor and healthful qualities. 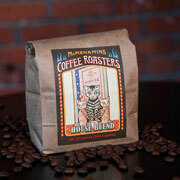 McMenamins Coffee Roasters goes through 70,000 pounds of beans a year in 20 to 40 pound batches. The beans are selected from small-farm growers producing plants of the highest caliber. 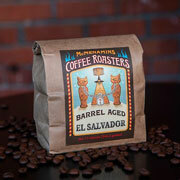 McMenamins’ decaffeinated coffee blend is processed in Veracruz, Mexico, where it is immersed in the clean glacial waters of Citlatepetl, the country's highest mountain. This method removes the caffeine and some flavor solids, but the “charged” water is filtered and redirected back into the beans. After brewing, the result is a full-flavored yet decidedly less “buzzy” cup of joe. 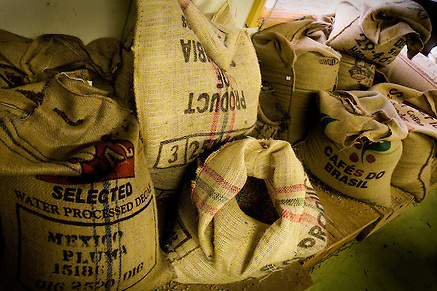 Every May and June after harvest time, dozens of Central American, South American and African coffee samples land at the doorstep of the McMenamins roaster. Each sample is roasted in our Portland roastery and then "cupped," a centuries-old ritual in which roasters sit together, slurping numerous cups of brewed coffees with silver spoons in order to best evaluate aromas and the flavors. From hundreds of farms, only a handful of the very best beans are then chosen. These select coffees are then roasted from light to dark until we find the perfect roast with the complex flavor profile we desire in a handcrafted McMenamins coffee. From the farmer who processes the beans after harvest to the roaster who brings out the beans' best flavors to the server who prepares your cup or pot of coffee, the process is a long and honored one. We hope you enjoy our fresh crop of amazing coffees, knowing that they were produced with care. 12-ounce bag, $11.50 * Seasonals available quarterly at our larger retail locations (Edgefield, Kennedy School, Bottle Shop, Anderson School) & select smaller gift shops. Recently at McMenamins Coffee Roastery in Northeast Portland, Martyn Leaper was talking about one of the benefits of his job. "After being here all day, you go somewhere else and it stays with you." He was talking about the comforting, pungent aroma of coffee beans roasting at 400-plus-degree temperatures in the unassuming building's Probat roaster. The wonderful scent envelopes him during his day-long shift, then follows him wherever he goes after work. Similarly, McMenamins' original master roaster, Dahna Maskell, had a wonderful, embracing personality that stayed with you even when she was worlds away. Around her, the most mundane parts of life could become new adventures just from the enthusiastic delight she infused into them. Dahna's passing in October 2007 has left a sadness in the lives and hearts of her vast circle of friends and family, but her embrace will long be felt from all that she gave us. Dahna brought her roasting business into McMenamins' fold in 2001. She schooled us in coffee and coffee service with a fascination and passion for the subject that in turn had us genuinely captivated. She was a great teacher and passed her knowledge along to McMenamins' next master roaster, Jen Apodaca. Jen talks of Dahna's encyclopedic mind for coffee - not just roasting techniques but the character and quality of beans, their color, smell, shape and consistency, their place of origin, farming practices and much more. "There's just so much to know," Jen exclaims. "It's ridiculous." Dahna had acquired a lot of books about coffee over time and she shared this library with Jen. During her first year working for Dahna in 2005, Jen devoted many, many hours poring over these tomes. Now she is bringing them out again for Martyn and assistant Cheryl Golden to study. "You just have to do it," Jen declared, "and you just need time." Dahna didn't have the luxury of time when she first got into craft coffee roasting. In the mid-1990s, she, her husband Joe and two kids relocated to Portland from Santa Cruz, California, and they scoured the city for viable opportunities to get a business going - any business. They came across Capt. Bean's roastery in Southeast Portland. Neither Dahna nor Joe had any experience in the field, but the owner was anxious to sell in order to launch a charter cruise business in Hawaii. The deal was sealed, and after receiving a two-month crash course in the finer points of roasting, Dahna was roasting on her own for the first time ever. For a consummate tea drinker (to that point), Dahna took to her new vocation remarkably well. It became her new passion - she worked and studied very hard, becoming in the process one of the region's first female master roasters. After a year or so, she relocated her roastery to its present site in Northeast Portland, and she gave it the new name, Café Splendid, which she soon rechristened Café Amour. Along the way she won several awards for the excellent quality of her coffee products. So, clearly McMenamins gained a lot when she agreed to join us six years ago. Dahna also gave us a handmade traditional whirling dervish costume, which has everything to do with coffee's long, rich heritage and is a spirited reminder of the fun she brought to life. The costume, with its colorful embroidery, special buttons and charms, is a descendant of those first worn by the Sufi order of Shadhili mystics who inaugurated the art of coffee brewing in the 13th century. These Muslim mystics used the potent brew to sustain all-night spinning ceremonies intended to get closer to God by altering their consciousness through ecstatic gyration. They were dubbed whirling dervishes by westerners who witnessed these ceremonies. As the Muslim religion was spread by these wandering Shadhilis throughout the Islamic world, so too was the popularity of coffee. Before long, the steaming beverage shed its religious associations and became a common drink in secular households around the globe. Dahna delighted in wearing this wonderful relic at social outings. And it's no stretch to say that like the Shandhilis of yore, she spread the love of and sophisticated palate for good coffee throughout the McMenamins' Kingdom. And that's a tradition that continues through her apprentice, Jen, at the company roastery. 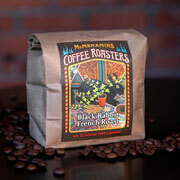 Next time you have a mug of McMenamins coffee, pause and savor the aroma that embraces you. There's more there than just a cup of Joe.